I know it's a bit of an old topic, but I haven't heard anything new about it recently. What do you guys think should be done about I-345 in downtown Dallas connecting I-45 and Highway 75? It's in pretty bad shape and TxDOT is deciding whether to continue repairing it or replace it entirely. There's a few people that think it should just be torn down and possibly replaced with an an urban boulevard. I wrote a blog post about it here. I'd love to hear some other opinions about it. I know it's a bit of an old topic, but I haven't heard anything new about it recently. In my view, the reason you have not heard anything about the removal idea is because anyone who has any sense realizes that the freeway must remain - it is critical to the functioning of the North Texas freeway system. That is why no political officials and no one with any influence has endorsed the idea. Not even Angela Hunt (as far as I know). That still leaves the option of sinking the freeway in a trench or placing it in a tunnel similar to the Klyde Warren Park tunnel on Woodall Rodgers. Of course, that that will be very expensive compared to repairing or even replacing the existing elevated structure. With the lack of funds available, the only realistic option is the least expensive option. My perception is that Project Pegasus (http://www.projectpegasus.org/) is next in line for funding in terms of downtown improvements. Project Pegasus is billion-plus project and it is not funded, so I don't see anything major happening on Interstate 345 unless is becomes unsafe. Anyways, architects always want to remove freeways, especially elevated freeways. That crowd in Dallas should be satisfied with the planned removal of S.M. Wright Freeway. why is it a critical part of the north texas freeway system. I personally experience this freeway segment daily, and IMO its merely a dumping ground for traffic that backs up going onto I-30 east and west. There is hardly any thru traffic at all. I totally agree, the US 75 freeway must stay as part of the potential I-45 extension that is widely discussed in roadgeek circles. I don't care what's done to it, as long as it remains what it is today. The lowest ADT on the facility is 149,000 per the DOT's ADT map; highly doubtful that all of that is destined just for downtown. And since when would traffic going from US 75 north of the Dallas CBD to I-30 east of the CBD not qualify as 'through traffic'? Here is a good article on who uses I-345. In the latest debate over whether anything should be done about I-345, now, a new political action committee has been formed to look into doing something. In my view, the formation of the PAC shows that the interests promoting the freeway removal have failed to get the needed political support. So now they need to change the political climate on Dallas City Council if they want a chance to achieve the freeway removal. So for folks who feel the freeway is a critical part of the regional freeway system and must remain in place (like me), it is good to see that the freeway has withstood the opposition so far. But the battle is ongoing, and the freeway is definitely not safe yet. I have to add my two cents worth on this topic. As a citizen of North Texas who often makes road trips into Dallas along I-30, I believe that I-345 is a necessity. Traffic along WB I-30 that want to continue towards I-35E NB and eventually SH 183 usually use I-345 and Spur 366 (Woodall Rodgers Frwy) to get to I-35E rather than face possible backups in the infamous Downtown Canyon and the construction zone that is known as the Dallas Mixmaster/Horseshoe Project. I hope that those people that want to tear down I-345 have a back-up plan for traffic around downtown Dallas or it could get very messy. Plus, if and when I-45 does ever get extended north, there needs to be what is there now, or a sunken/cut-and-covered alternative, if it is to continue north. 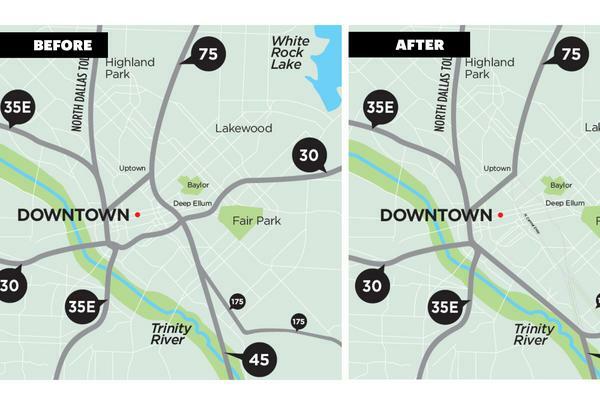 Getting rid of the connection between Woodall Rodgers and I-30 will just make everything end up on the other remaining freeways (I-30, I-35E, Woodall Rodgers) in order to get back around to the other side. It might *look* better to some to not have I-345 (or any future farther north version of I-45) but any real push to not have it now is about 45+ years too late IMO. The opposition is now promoting a plan to remove not only Interstate 345, but also IH-30 and IH-45. I think this is so crazy that it will undermine the credibility of the group. Much of the traffic on IH-30 is originating from or going to downtown, and this plan would make that very inconvenient. Much of the traffic on IH-30 is originating from or going to downtown, and this plan would make that very inconvenient. Even if this doesn't support a complete teardown, it does justify stubbing it east of downtown, with the non-downtown traffic using the bypass. So you are in favor of a discontinuous I-30? 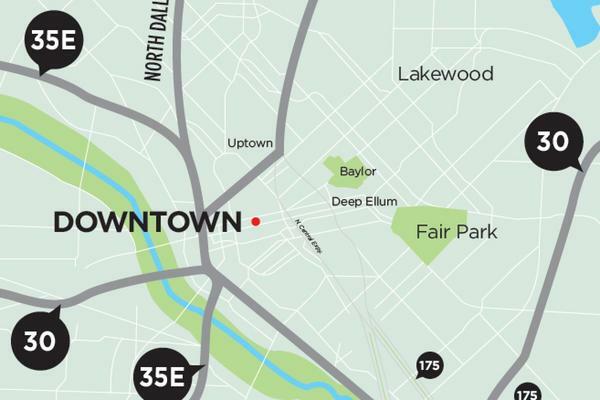 The funny thing about those plans is that while they'd do a commendable job of reconnecting South and East Dallas to downtown, they'd almost necessitate the Trinity Parkway, or placing a 30 lane 35E/45/30 mishmash in the middle of it all. One good fuel tanker fire in the middle of the north I-35E/I-30 interchange and you've just severed the entire freeway network. And that's not even counting the USACE hassles with building inside the Trinity floodplain and crossing the levee and the billions of dollars in construction since the entire thing will probably need to be elevated. And then some fucknuts will come along a few years later and want to tear it down because it obstructs views of the river. Worst idea ever. So you still honk your horn at geese? as a resident of East Dallas, that realignment of I-30 to the south would be awesome. Probably not happening though, with the HSR wanting its northern terminus to be near that alignment. I will also say, the currently design makes I-345 seem so much more crowded and necessary than it is. The left hand exits and merges cause so much crossing of traffic. I-30's old design in the same vicinity does the same. Just a few exit and onramp changes would make it seem so much less busy and necessary. One good fuel tanker fire in the middle of the north I-35E/I-30 interchange and you've just severed the entire freeway network. Much less the truckers that flip on their sides and end up blocking multiple lanes of traffic, which seems to happen around north TX more often than tanker fires. I'm thinking of that fire in 2007 that took out a few ramps at the MacArthur Maze in Oakland. They were closed for nearly a month because the fire damaged some of the steel supports. The traffic hassles it caused were no picnic, but at least there were alternate routes that didn't require going too far out of the way. Take something like that and make it happen on that new configuration and literally stop all traffic through central Dallas for a month. There was a crash and fire at TX 183/Loop 12 by the ex-Texas Stadium lot about a month+ ago, damaging part of the TX 183 overpass. Fortunately, it wasn't very inconvenient other than for some TX 183 traffic. I remember hearing about a crash and fire a few years ago down at the US 175 transition between S.M. Wright and C.F. Hawn freeways; it was right at the curve and underneath the NB TX 310 overpass. That one was much worse, all the 175 traffic that day had to use service roads and side streets to get around the wreck, and the TX 310 overpass had to be rebuilt because of the effects of the fire. It's clear that the anti-345 folks don't really understand what they are asking for (and definitely will get) when they want such a dramatic freeway change such as this. Oh, I disagree...I think they understand perfectly what they want. They want to make highway travel so restrictive and automobile use so hellish that people then are forced to convert to their New Urbanism "vision" of surface boulevards/bikeways/streetcars/light rail. I'm not opposed per se to more alternative means of public transportation to relieve freeway congestion...but tearing down perfectly useful freeways just to build more highrises merely for more gentrification? Sheer madness. Its not madness. As built, the downtown freeway system is highly inefficient for transportation needs with many ridiculous left hand exits and onramps and creates large blight below. Its useful because its there. The fact that TxDOT is even listening should tell you something. Besides, Dallas has a right to protect its city and not just be a slave to the interests of those outside of it. There are better alternatives to how it is currently built and TxDOT is wisely going to explore those options as the structure is old and inefficient as far as their needs go. A cut and cover tunnel would be awesome and serve the needs of both. Getting rid of the exits and onramps that feed I-345 downtown would be a great start. This should be at most a narrow, 4 lane thru traffic road. Everything else backs it up needlessly. Upgrading the existing system to remove inefficiencies (left turn exits, for example) and replacing elevated viaducts with depressed/cut-and-cover tunnels, I have no problem with. Those supporting this plan, though, don't want that; they want to totally remove these major freeways and either replace them with surface boulevards or simply re-route the traffic on already burdened existing freeways...all because "we don't like cars and freeways contaminating our gentrification efforts". They are the mad ones, not you. Note that that comment was directed at the "Tear 'em down!!!" advocates, not TxDOT.